The Top 10 Historical Sites in North Dakota! The Roughrider State has played a significant role in major events throughout America’s history. From historic missile sites, to forts playing a pivotal part in the state’s Native American history, to entire village’s dedicated to replicating life in the 1800s, it isn’t hard to immerse yourself in history in North Dakota. These 10 historical spots take you on an exciting trip to the past. The Bagg Bonanza Farm provides visitors with an authentic look at life on a bonanza farm in the early 20th century. Once encompassing over 7,000 acres, the farm operated between 1915 and 1935. Now a 15-acre museum, the complex’s centerpiece is a fully restored 21-bedroom house that gives guests a one-of-a-kind trip back in history. The Bagg Bonanza Farm was declared a National Historic Landmark in 2005. The Fort Totten Historic Site is an important vestige in the state’s Native American history. The location was built in 1867 and served as a military post until it became a boarding school in 1890. The primary buildings at the site have been preserved, giving visitors a realistic historical experience. Interestingly, the site was also used as a Tuberculosis Preventorium from 1935-1939. Fort Totten became an Historic Site in 1960. The Cold War was an active time in North Dakota. The Minuteman Missile Site includes the last fragments of the 321st Missile Wing, a collection of intercontinental ballistic missile launch sites that were created to provide surface to air protection for the Grand Forks Air Force Base. The site consists of two distinct facilities, the Oscar-Zero Missile Alert Facility and the November-33 Launch Facility. Visitors will receive a guided tour of the realistic topside facilities and an unparalleled glimpse into life during one of the tensest political times in the country’s history. Over two centuries ago, the Lewis and Clark Expedition came upon the Knife River Indian Village area. The Hidatsa Indians provided the duo with valuable intel and the groups became steadfast allies. Today, the 1,758-acre site is a collection of archeological remnants of the Northern Plain Indians. In 1876, Lt. Col. George Armstrong Custer and the Seventh cavalry attacked the Sioux Indians living at Little Big Horn, a battle that ultimately proved fatal for Custer and his men. The area from which the brigade departed is now commemorated at the 1,006-acre Fort Abraham Lincoln State Park. Important buildings of the military post have been reconstructed, including the Custer House and the earth lodges of the 16th century Mandan Indians. North Dakota’s largest museum, the heritage center is a collection of artifacts dating back to the earliest inhabitants of the state. Interactive exhibits include the Adaptation Gallery: Geologic Time, the Innovation Gallery: Early Peoples, the Inspiration Gallery: Yesterday and Today, and the Governors Gallery: Green Revolution. In addition, the museum has a special children’s exhibit area called the Treehouse. In 1883, Antoine de Vallombrose, also known as the Marquis de Mores, arrived in North Dakota. 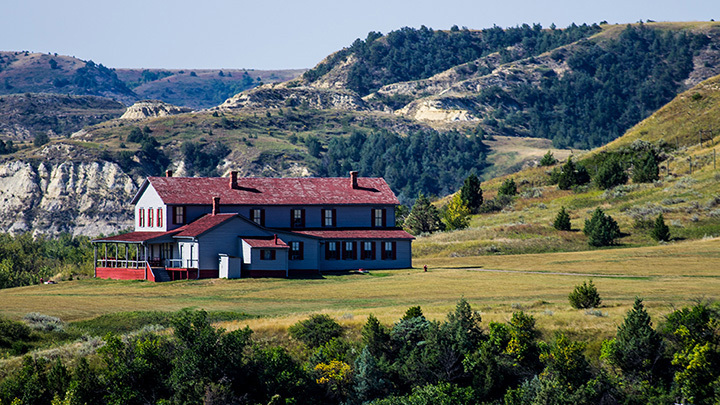 Among his many accomplishments, Antoine created the town of Medora, which is now one of the state’s biggest tourist attractions. The Chateau de Mores State Historic Site includes a 26-room, two-story building erected in 1883 as the family’s summer residence. The home is now a museum that provides visitors with an authentic look at the family and its lifestyle. In 1829, the Fort Union Trading Post was constructed at the intersection of the Yellowstone and Missouri Rivers. Eventually, the post became the top fur-trading post in the area. Doing business until 1867, Fort Union was also the longest lasting. The post has been reconstructed to give visitors the highest degree of authenticity. The flagship structure is the elegant Bourgeois House, which was reconstructed in 1987. Located in the northeastern corner of North Dakota, the Pembina State Museum may not be as well-known as its larger counterparts, but it is a thrilling museum nonetheless. With a rich Native American heritage in the area, the museum pays homage to the Ojibwa, Dakota, Assiniboine, and Cree tribes. The area was also an important fur trade post, which adds another dimension to the museum’s artifacts. One of the most stunning parts of the museum is likely its observation tour, which stands seven stories above the ground and offers visitors a 360-degree view for up to ten miles. Interested in experiencing an authentic representation of life in the 1800s? A visit to Bonanzaville is in order. Step inside an authentic blacksmith shop, cozy up to the bar at the Brass Rail Saloon, try to imagine a typical day at the Dobrinz School, or stroll through the Law Enforcement Museum. Few activities will make you more grateful for the contemporary luxuries that are so easy to take for granted. Bonanzaville is open year-round and portions can also be rented for special occasions. View more North Dakota Historical Sites.